The Exclusive Option Leather Stitched Door Airbag Trims feature rich leather that matches other leather components your the door panel. Replace the hard plastic trim that reads "airbag" with soft leather and add that exclusive look to the standard door panel. 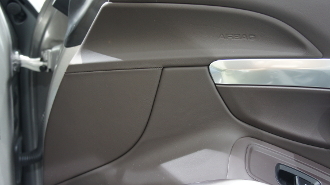 These are not actually airbags, but aesthetic trim panels on the doors. These fine exclusive leather trimmings look perfect with the Leather A-pillar Triangle Trim option.